Contrary to the rumours, Apple has only announced the Apple Watch Series 4 and the new generation of iPhones - iPhone Xs, iPhone Xs Max and iPhone Xr. Apple has finally announced the 2018 lineup of iPhones and a new refreshed Apple Watch Series 4. Contrary to the various reports and leaks, Apple has only launched these two products and didn’t touch upon the rumoured iPad Pro, a cheaper MacBook, the next generation of AirPods and the AirPower wireless charging mat. The Apple Special Event at the company’s Apple Park headquarters - which now runs on 100 percent renewable energy - also saw the discontinuation of the iPhone X, the iPhone 6s and the iPhone SE in the US market. The company first launched the Apple Watch Series 4 with a string of new functional and design changes. Company CEO Tim Cook started by saying that “Apple Watch is the number 1 watch. Period.” The company has increased the size of this year’s Apple Watch to 40mm and 44mm for a larger display which, it claims, is 35 percent bigger from its predecessor. The “redesigned and re-engineered” display is now edge-to-edge and shows more information on the screen. The iconic digital crown is redesigned, is more accurate and gives a crunchy feedback. 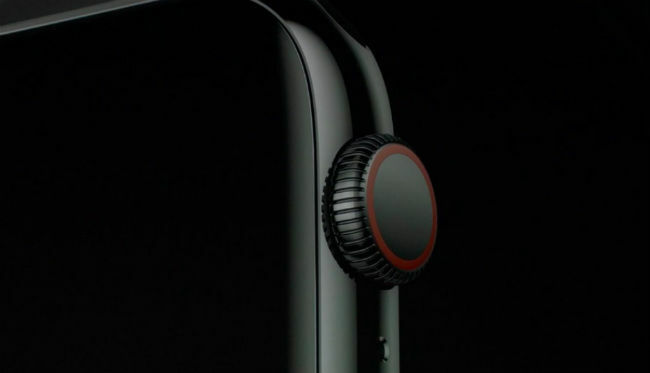 Apple has included a new speaker and claims that it is 50 percent louder that the one in the Apple Watch Series 3. The microphone is on the opposite edge of the watch with a sole purpose of reducing the echo. On the hardware front, the Apple Watch Series 4 runs on the S4 dual-core SoC and comes fitted with electrodes on the back that help enable the watch take an ECG as well as detecting Atrial Fibrillation or irregularities in heart rhythm. The feature is both FDA and American Heart Association certified. Apple says that the radio waves now can now emit from the front as well as from the back and will deliver clear conversation and stronger connectivity. The Apple Watch Series 4 is able to detect fall. Additionally, if the watch doesn’t detect any movement for a minute, it will automatically send out an SOS notification to a predetermined contact along with the user’s location. The Apple Watch Series 4 will be available for $399 for the GPS only variant and $499 for the Cellular edition. The watch will be available September 21 onwards in several variants. The new Watch will be available in three colour finishes; Space Gray, Silver and Gold. There’s also a Stainless Gold variant which comes with a matching Gold Milanese loop. Additionally, there’s also the Nike+ variants which come with Pure Platinum and Black sports band which include a reflective material woven into the band. The iPhone Xs and the iPhone Xs Max feature Apple’s new A12 Bionic chip with a new Neural Processing Unit capable of performing 5 Trillion operations per second. Apple says that the previous SoC, the A11 Bionic could perform 600 Billion operations in the same time frame. The A12 Bionic chipset is based on the 7nm manufacturing process with 6.9 billion transistors, six core CPU and four core GPU. 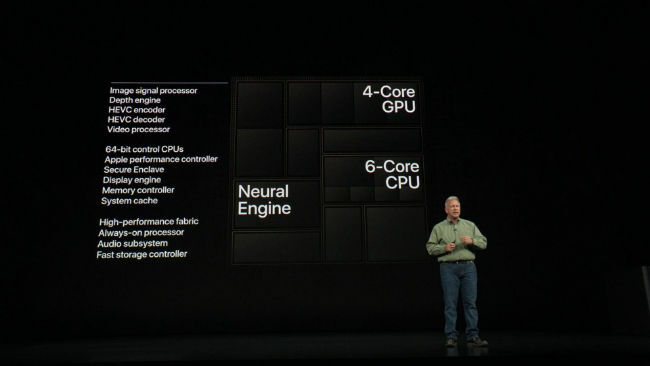 Apple says the performance cores are 15 percent faster and consume 40 percent lesser power. The four efficiency cores are also claimed to consume 50 percent lesser power. As compared to the previous chip which has a 2-core engine, the neural engine on the A12 Bionic has an 8-core design that helps the apps to launch 30 percent faster. 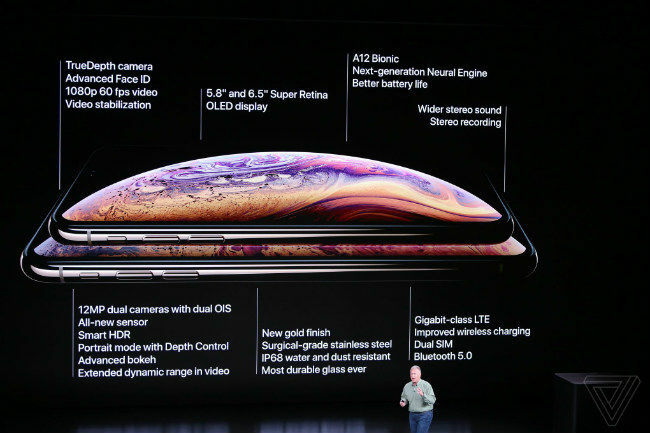 The iPhone Xs features a 5.8-inch OLED Super Retina True Tone display with a notch, while the Xs Max sports the same display in a 6.5-inch size. This year’s iPhones also get a surgical steel chassis and a glass back. Apple claims that glass at the back is the most durable glass ever in a smartphone. The phones come with IP68 water and dust resistant rating which means they can be submerged in 2-meter deep water for up to 30 minutes. The iPhone Xs and the iPhone Xs Max come with Dolby Vision and HDR Support. 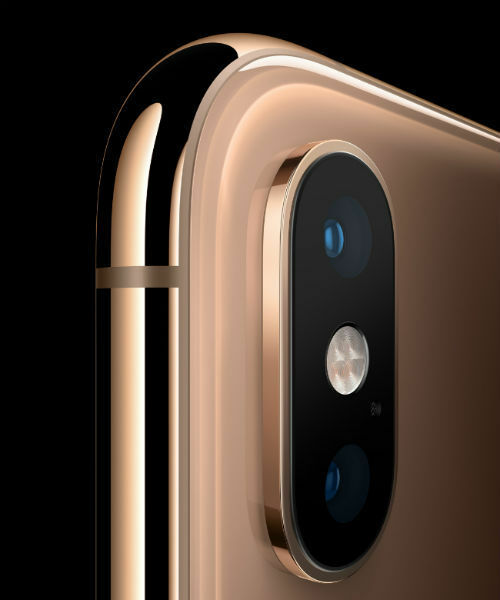 When it comes to the cameras, both the iPhone Xs and the iPhone Xs Max carry forward last year's True Depth 7MP camera system on the front. Apple says the new camera can now unlock faster than its predecessor and take better Bokeh photos. Both phones feature a dual 12MP+12MP Wide Angle + Telephoto lenses at the back. The aperture for the wide angle lens stands at f1.8, while the Telephoto lens offers f2.4 aperture. Apple claims that the new A12 Bionic chipset can allow for capturing four frames with zero shutter lag, and a long exposure for detailed shadow. 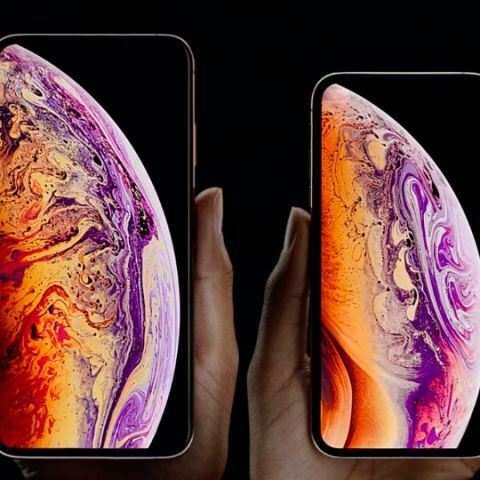 The iPhone Xs and iPhone Xs Max come with Gigabit-class LTE for faster download speeds and Dual SIM-Dual Standby (DSDS) through the use of a nano-SIM and digital eSIM. In India, Airtel, Vodafone and Reliance Jio are said to offer the eSIM facility on the new iPhone Xs and Xs Max starting later this year. Apple will offer the iPhone Xs and Xs max with normal dual SIM slots only in China. The iPhone Xs and iPhone Xs Max will be available in 64GB, 256GB and 512GB storage capacity. Both phones will be seen in Space Grey, Silver and Gold finish. In India, the iPhone Xs 64GB variants starts at Rs 99,900, 256GB for 1,14,900, and 512GB for 1,34,900. The iPhone Xs Max starts at Rs 1,09,900 for the 64GB variant, while the 256GB costs Rs 1,24,900 and the 512GB variants is priced at Rs 1,44,900. The iPhone XR is the most affordable of the three iPhones launched this year. It borrows the design from the iPhone Xs and iPhone Xs Max, but comes short on features front. Unlike the other two smartphones, the iPhone Xr comes equipped with a 6.1-inch LCD “Liquid Retina” display and a single camera at the back. The phone is built with an aerospace-grade aluminum and ships in six colours. Apple has equipped the smartphone with the A12 Bionic chip and provided the same power to the variant as the other two models. In the camera department, the iPhone Xr features a single rear camera with a f/1.8 12MP wide-angle sensor and Optical Image Stabilisation. There is also a 7MP sensor that can capture selfies in portrait mode. The smartphone is also IP67 certified and is designed to withstand water splashes. Apple claims that the iPhone Xr can deliver up to one and a half hours of extra usage than the iPhone 8 Plus. 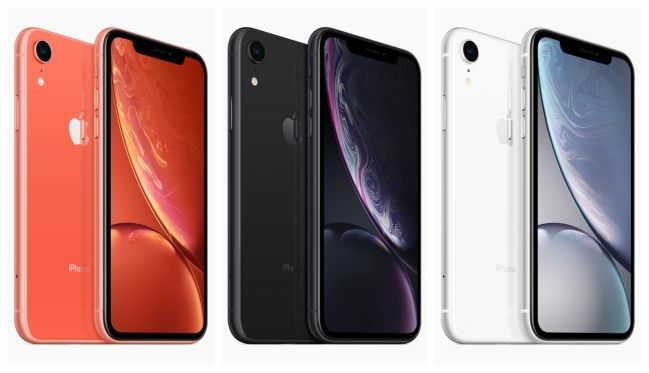 In India, the 'cheaper' iPhoen Xr starts at Rs 76,900 for the 64GB variant, the 128GB variant costs Rs 81,900, while the 256GB variant costs Rs 91,900.